I’m back in LA after a fast-paced week around the world. My trip took another twist on the way to Ho Chi Minh City, which I will share tomorrow morning. As it was a relatively light news week, Live and Let’s Fly focused more on trip reports than breaking news. But importantly, Airbus and Bombardier joined forces on the C-Series program, a game-changer in the subsidy fight with Boeing. Rumors of a JetBlue-United merger spread, though I do not put much stock in them. 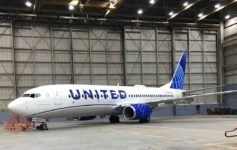 Will JetBlue and United merger? A controversial airline analyst says yes, but I argue no. Pay attention to visa requirements on low-cost-carriers, even when you think they do not apply to you! Carly reviews business class on a Chinese high-speed train. Does Lufthansa First Class remain a competitive product? Read my review to find out. Finally, Lie-Flat Beds on My Ethiopian Airlines Flight! Drunk United Passenger Urinates on Seatmate…and FAs Ignore? Next Article U.S. Air Force May Recall 1,000 Pilots. Impact on Airlines?